No entrance or parking fees. Some events require purchase of tickets. Family fun for everyone! Hayrides, train rides, crafters, vendors, food, farm animals, bounce house, face painting, games and of course, tons of pumpkins! Individual rides and activity booths, including pony rides, rock wall, bounce house, and pumpkin painting, have their own set price ranging from $2 – $7. Costume Contest Every Saturday At 1pm! Pie Eating Contest Every Sunday at 1pm! Visit the oldest home in Manatee County by candlelight; enjoy decorated themed rooms and hear the history of Halloween! At end of the tour, children will receive Halloween treats. Big league family fun at Ed Smith Stadium! Children dress up in costume to enjoy games and activities on the concourse and outfield from 5-6:30 p.m. ​ A costume parade around the bases begins at 6:40 p.m. The movie, Hocus Pocus (PG) begins at approximately 7 p.m. Bring a blanket to enjoy the movie on the outfield or watch from stadium seating. 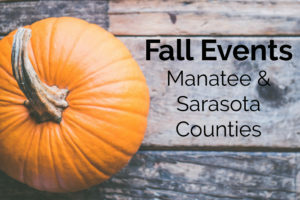 Bring the family out and join in the costume contest, face painting, hayrides, and bounce houses!Manatee County Parks and Natural Resources Department is celebrating its 16th Annual Goblin Gathering in conjunction with National Night Out at G.T. Bray Park. This year’s event will be held in conjunction with National Night Out, which is a program to strengthen neighborhood spirit and create police-community partnerships to make our community a safe place to live. The Halloween Social is a FREE community event full of spooky fun for the whole family! There will be trick-or-treating, crafts, carnival games, and face painting; Fabulous Fatimir will be telling fortunes; the costume contest is at 5pm. Travel through a jungle safari in the Ag Museum and encounter pixies and pirates in the Carnegie Library. Come out and explore, watch our local dancers, and enjoy our spooky balloon artist! Have your children bring their Trick or Treat bags to collect the many treats that will be given out from our generous sponsors and merchants. Mummies, ghouls, and little monsters delight – The Sarasota Farmers Market will be quite a sight! Come to trick or treat – while supplies last – stay for the costume contest – it will be a blast! Live music and crafts and surprises in galore – you won’t want to miss what we’ve got in store! Selby Spooktacular is a playful, family-friendly event. Daytime activities will include traditional, wholesome Halloween happenings like trick or treating and pumpkin decorating, fun and educational activities like seed planting, as well as more frightening (but not too scary) options for older children like a mad scientist experiment center. Children are encouraged to bring their own trick-or-treat bags to collect their goodies. Come in costume! Super fun family friendly event, we will have truck or treat, all kids in costume can truck or treat at any vendor or food truck, Pets welcome, there will be food trucks multiple merchants and live music, along with a relaxed fun atmosphere. There will also be a haunted house. Our fabulous Halloween event, in its 10th year, returns for the “young and young at heart.” Fright Night on St. Armands transforms St. Armands Circle from island sophistication to Halloween fun. Decorated storefronts set the stage for wandering spirits of St. Armands past; frightening characters appear around every corner amidst statues dressed in the Halloween spirit. Children trick-or-treat throughout the Circle with numerous retailers and restaurants contributing to the Halloween spirit with customized promotions. In collaboration with the Sarasota High School Theatre Department, a performance of “Thriller” will take place around 8:00pm.